The Trainer Snippets report shows that Malcolm Saunders has a particularly good record with his runners when they are turned out again within seven days of their previous race. He's managed have eight winners (40%) and 12 places (60%) from 20 runners for level stakes profits of 20.19 and 30.06, which has also produced an Impact Value of 2.83. He runs Showmethewayavrilo at Kempton today and he fits the bill. From the current form it shows that he was a winner two runs ago on the soft going at Goodood, and his overall form has a much better look to it on the all weather when compared to the turf. Today's race is over seven furlongs which is the first time he has been stepped up to this distance, however, he has been seeing some of his races out well, including last time at this track, and I think he may have some untapped potential at this distance. To further his chances on the all weather tracks, his sire, Showcasing, has an improved record with his runners on these courses and shows a level stakes profit from 344 runners. 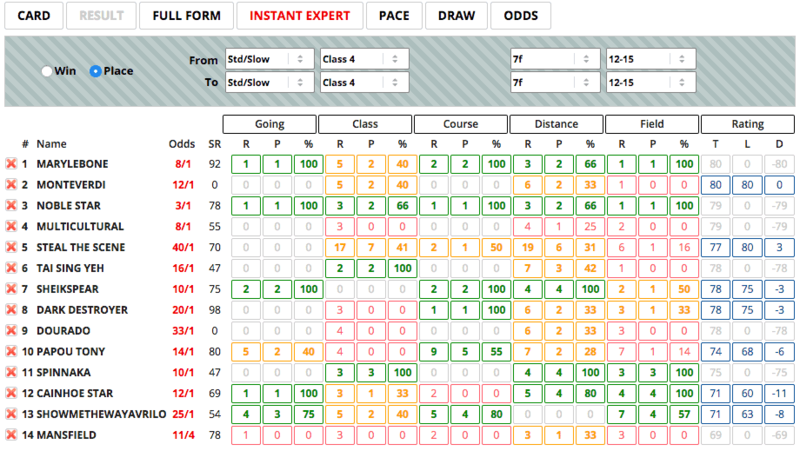 When expanding the trainer form from the racecard it shows that Malcolm Saunders' form is encouraging for a number of different aspects. He has been in excellent form over the past few weeks, being 4/7 for 25.35 points and an IV of 5.85. He also has useful form here at Kempton over the past five years, again showing a healthy strike rate and level stakes profit. The Instant Expert report shows that Showmethewayavrilo is reasonably well suited by today's conditions, however, so are quite a few of the others and it should be noted that he is eight pounds higher than for his last win. He will need to produce near to his best but I feel he is overpriced to do so. Although early leaders here over this distance have a good record with 16.72% of them going on to win the race for a level stakes profit of 109.92, there doesn't appear to be a great deal of pace in this race which bodes well for Showmethewayavrilo due to not having raced over this far before. He usually races in mid-division, although with his speed I think he may be a little closer to the pace today, and if the race isn't too quick he will be able to use that speed inside the final furlong and hopefully grab a place at least at a big price. 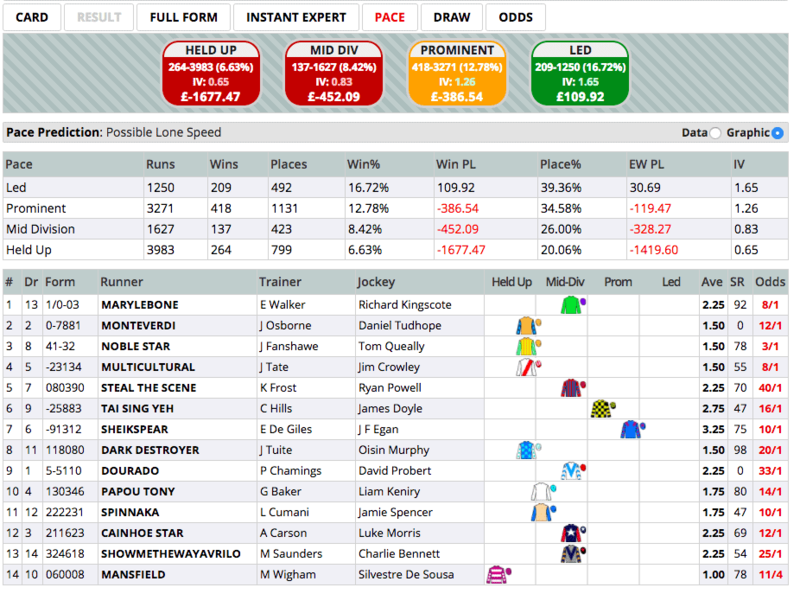 Click here for the 18:25 at Kempton.